I had planned a bigger hike today, but I didn't get started as early as I would have liked an it was snowing pretty good. 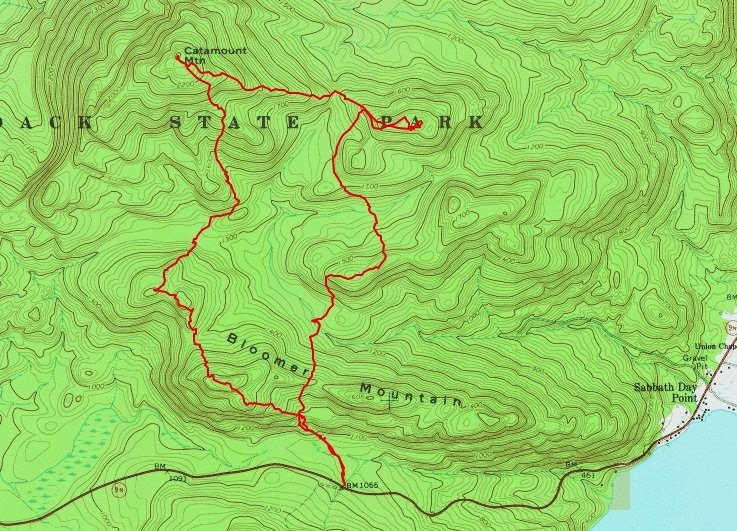 I came up with an alternate plan to do a bushwhack hike in the Lake George Wild Forest. I had never explored any of the LGWF north of Route 9N in Hague, with the exception of Jabe Pond. I parked at the northern terminus of the Tongue Mountain Trail, but instead of following the trail south, I began a bushwhack to the north. 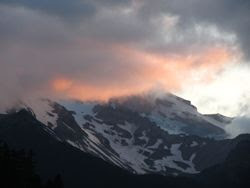 Within minutes, the cliffs of Bloomer Mountain were in my face. I worked my way west to get to an easier way up the face. I had plotted out a tentative route and I was able to follow it for the most part. As I got near the top of Bloomer Mountain, it appeared that the sun was going to come out, but it was not to be. It only took 40 minutes to climb the .8 miles to the top of Bloomer. From Bloomer, I dropped over the NW shoulder to head for an un-named hill. This was the toughest part of the day. I descended a fairly steep slope in a dense section of forest. The rest of the day I was able to bypass any blowdown or dense growth. On the un-named hill, Rev and I saw a pair of deer and we watched them for a few minutes before they decided to put a little more distance between them and us. We saw several more groups of deer later in the day. There were a lot of tracks almost everywhere we went. In the lowland beyond the hill, I was able to cross a frozen beaver pond, then began to climb Catamount. It was a thousand foot climb from the beaver pond to the summit. The snow cover on the ground ranged from about 4 to 6 inches and it snowed 2 inches while I was out. With the snow coming down, I had no visibility for most of the day. I reached the summit of Catamount and couldn't see anything down below. In any case, it was a good time to stop for some food. I added a layer, since I was hiking in a short sleeve shirt and a shell. It was about 30 degrees, but the was a moderately stiff breeze that made it feel colder. From Catamount, I worked my way down the ridge on the east face and headed towards another un-named hill. This hill seemed like it would have had the nicest view of the day if visibility had been better. I could barely see neighboring hills and ridgelines though. From this hill I headed due south to return to Bloomer Mountain. In the valleys I was able to cross several creeks and vlys without any problems. Just before I reached the last stream crossing, I cam across what appeared to be the remains of an old road. Looking at the topo map, it appears it may be a continuation of a road that leads west from Sabbath Day Point. I crossed the last vly and made my way back up Bloomer Mountain to reconnect with my track on the ridge from the morning. As I climbed, I noticed that I had broken one of my microspikes. One of the chains had ripped out of the rubber eyelet. After this happened, the microspike didn't stay on very well. It was good that the microspike broke near the end of the hike and not the beginning. As we neared the car, Rev found a bone from some animal and she wasn't too keen on leaving it behind, but it wasn't coming in the car with us, so I made her part with it. She did get a treat at the car though.